Sorry about not blogging yesterday. I actually had a card made and ready to go; but somehow I just never quite got around to putting it up. 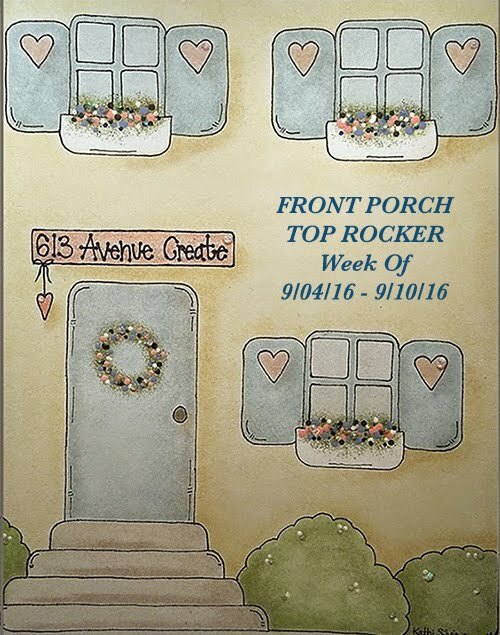 My first card is for this past week's SCS sketch challenge. I used Razzlin Razzleberry as my base with a layer of Melon Mambo that I ran the Cuttlebug wit the Swiss Dots folder. the two pattern pieces are from the Prima Marketing Sasha Collection that I use all the time with the new In Colors. It just coordinates so well together. 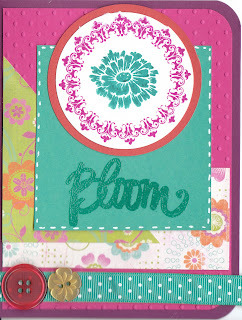 The sentiment at the bottom of the Bermuda Bay piece is from Little Yellow Bicycle's "Zinnia" stamp set and so is the floral image in the center. I stamped the outer ring with Melon Mambo ink and the center in the Bermudas Bay. I added the white stitching around the edge and then put the Bermuda Bay Ribbon and the buttons at the bottom. Ever since I got that big bag of Flora Doodle Buttons, I am loving them! My second card is for today's Get Sketchy Challenge. For this card, I decided to start with Bermuda Bay (I think it's my favorite new color!) and then added a layer of Crushed Curry which I stamped with the retired SU Print Pattern Stamp. I embossed the Soft Suede piece with the Swirls embossing folders and then used my Petite Oval Nestabilitie for the layerd ovals on the side. 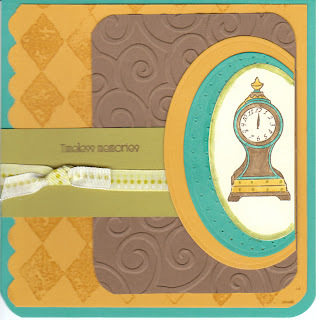 The clock image and "Timeless Memories" sentiments are from Clear Dollar Stamps "Ageless Antiques." 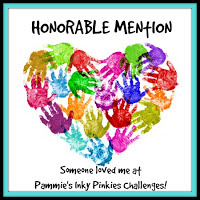 The ribbon around the Kiwi Kiss piece in the middle is from Chatterbox. I just saw the WSC for this week; but I think I'm going to wait for the OCC challenge tomorrow to see if maybe I can combine the two of them in some way. 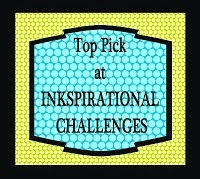 Now watch, the OCC will be a sketch challenge as well and my plan will be foiled! TGIF everyone! Enjoy your day. gorgeous cards...I absolutely adore your choices of colors...sooooo happy! Thanks for joining us over at Get Sketchy! Dang girl... this is fabulous. You are on a roll. Great pair of cards! That first one is so colorful! LOVE it! I really like the layout on the 2nd card...great mixture of pattern and texture!! TFS! Both cards are great, but the 1st is definately my favorite. I love the bright colors!! I had no idea you were an author! beautiful cards! and I love the sketch of 2nd card! TFS! 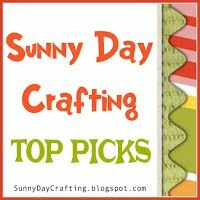 Your cards are so pretty and the color combos are great! I think you really rocked the sketches too!!! Lovely card! It really blooms! Thanks for playing at GS! Beautiful happy card! I like the combination of colours and papers you used. Thanks for giving our sketch a try! Wondeful take on the sketch, love the image and your colors! Love both cards - the colors are so pretty!